The camp commenced on Friday evening with a Dan Shim Sa, with the testing panel including regional Masters Farquharson and Estrada, and headed by Kwan Jang Nim J. John St. James, Federation Grandmaster. All those testing and reviewing did well, with all those testing passing the written portion of the Dan Shim Sa (final review of the physical examination is forthcoming), and the “Best of Test” award was given to Mr. Josh Pitman, of Waco, Texas…a student of Master Peter Estrada at Abilene Karate Academy. Non-testing students were treated to casual time at the swimming pool followed by hiking and classes conducted by Kyo Sa Paul Lopez and Kyo Sa Rick Crouse of Thunderbird Martial Arts in Albuquerque, New Mexico. Camp orientation following the Dan Shim Sa included a commencement address and safety briefing by Master Peter Estrada, and words of wisdom and welcome from Kwan Jang Nim J. John St. James. Following breakfast the next morning, students assembled once again in the main center at Butman Camp to review expectations and scheduling in preparation of a full day of training and seminars, which were hosted by a variety of skilled instructors from across the region. 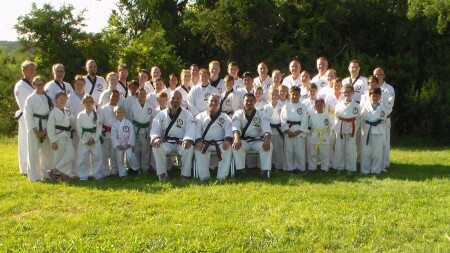 Morning classes included Hyung development for all ranks, a variety of Ho Sin Sul classes, and practical applications such as rolls & falls, takedowns, and disarming techniques. The great number of certified instructors made it possible to host multiple concurrent sessions for the large number of students in attendance. Following lunch, many students enjoyed some time for extra-curricular activities, including swimming, basketball, rock-climbing, while those students enrolled in the CIT (Certified Instructor Training) Program were treated to a very special seminar hosted by Kwan Jang Nim St. James in the main center. Kwan Jang Nim St. James went on to teach a special, private class to the attending Sam Dans and Masters, reviewing advanced Hyung…a special honor, indeed, for those in attendance. The afternoon was, again, comprised of a large variety of classes and seminars, including weaponry, hyung technique, and advanced and intermediate legwork, leaving campers physically weary, but strong in spirit, and excited for the evening classes to commence following dinner. Kwan Jang Nim St. James produced an informative leadership presentation for many campers immediately following the evening meal, and a Healing Warrior Society presentation following that on healing hands (acupressure), while other instructors taught classes ranging in subject. The following morning gave campers the opportunity to train in Basic Kick Deep Dive with Master Peter Estrada prior to breakfast, and, after breakfast and group photographs, all students were treated once again to a variety of class sessions. Camp concluded as per tradition with Group Hyung to Drum in a field, conducted by Kwan Jang Nim St. James. It was agreed by all in attendance that this was the best Southwest Regional Leadership Camp and Dan Shim Sa to date. The instructors and school owners on-hand, both in quantity and quality, gave campers an extraordinary amount of choice in the training they received, and the variety of classes held was appreciated by all. Master Peter Estrada was personally recognized by Kwan Jang Nim St. James with ovations, for his exemplary efforts in hosting the camp, and all eyes look forward to the next amazing event in the Southwest Region.